Coleslaw is such a summer BBQ staple. I'm often sucked into ordering it as a side at restaurants to satisfy a craving. Unfortunately, I'm also often disappointed with what taste like pre-made dressings. The only way to truly satisfy the coleslaw craving for me is to make it myself. If you need a slightly more dressed-up version to serve at a BBQ, try this one. It's green hues are nice to look at and the touch of miso in the dressing gives it a more interesting flavor. Combine all the ingredients for the dressing, making sure the miso is distributed throughout. Set aside. Core the apple by cutting four sides away from the core. Cut each of these sides into very small apple segments the way you would for a tart and cut each slice into matchsticks as shown above. 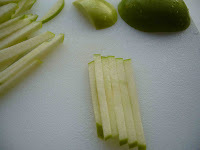 Cut celery stalk into segments that are a similar length to the apples and cut each segment into matchsticks. 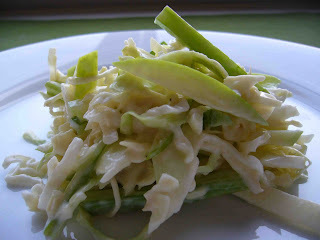 Combine cabbage with apple and celery matchsticks. Dress and enjoy! Yum! What a great twist on the average American coleslaw.